Seriously tasty and well worth the time and effort – a dish for a cold snap, full of wintery flavours and scents. And so adaptable to any meat really. Heat the oil in a large casserole dish. Add the onion and garlic. Cover with lid and cook gently for 10 minutes. Stir in the cabbage, balsamic vinegar, sugar and all spice. Cook for a further 5 minutes. Pour over the orange juice and zest, red wine and stock and bring to the boil. Cover with lid and transfer to the oven for 1 hour and ten minutes. After an hour pan fry the chicken skin side down til it is coloured. When red cabbage mixture is ready, remove from oven, take lid off and nestle your chicken pieces in the cabbage. Reduce oven to 180 c / 160c fan, then pop casserole back in the oven uncovered for 30 minutes til the chicken is golden and cooked through. Remove from the oven and scatter the parsley over the dish – serve with creamy mashed potatoes, or dauphinoise potatoes. Drizzle any spare juices over the potatoes. Fabulous! This is one of my favourite supper dishes of the meat variety. Perfect served with noodles. Please give these a go. You will be so glad you did! Pop the mince and breadcrumbs into a large mixing bowl. Grate the zest of the lemon into the mixture then halve the lemon and squeeze in all the juice. Add chopped parsley leaves and the thyme stripped from their sprigs. Now add the parmesan – and the anchovy fillets chopped – or of not a good grind of sea salt. Now add several good grinds of black pepper. Using a dessert spoon make about 18 small balls of the mixture. Sprinkle the flour on a board and add each meatball to it as you make them. Roll them lightly in the flour. Add the oil to a wok – or large frying pan. Fry the balls on a medium heat for about 4 or 5 minutes, until crispy golden. Lower the heat and let them cook through for about another 8 minutes. Try not to move them now. Then spoon off most of the fat and add the hot chicken stock. Leave to bubble for 2 or 3 minutes. I now added some finely shredded raw vegetables – bits I had left over – a few bits of broccoli, a couple of cabbage leaves, half a carrot. Whatever you fancy! Or you could leave them out too! Tis up to you. I also now added my lightly cooked noodles to the dish and stirred round gently to soak up the flavours. Thank you again to Nigel Slater for this fab recipe idea. Magnifico! And a Happy Birthday to him for April 10th! This is a fabulous supper dish – great on its own or accompanying chicken, sausages, pork loin, even salmon. The flavours and textures are hard to beat. So simple, so satisfying and somehow something that feels as if you have spent a lot more time on it than you will have. I saw this recipe first on a Nigel Slater cookery programme – he is a real wizard with tasty supper dishes. Taleggio is perfect for this – a Northern Italian soft cheese that melts to unctuous perfection. Fontina would work also. Do not remove the skin – there lurks so much of the fragrance and the flavour! For 2 as a main – 4 as a small side dish. I used 750 gm potatoes for 3 of us last night. Slice the potatoes into pound coin size slices – some lengthways some across. Heat the oil and butter in a sauté pan or large frying pan, and once the butter has melted, add the onion. Fry over a low to medium heat gently until the onion begins to become soft and pale gold, about ten minutes. Then add the garlic, potatoes, mushrooms plus a good sprinkle of dried thyme or a small handful of fresh thyme leaves, some salt and black pepper. Stir gently to get all the potatoes coated in the oil and herbs. Turn the heat as low as you can. Pop a lid on for 40 to 50 minutes, stirring every now and then. The potatoes will turn soft and golden – but not crispy – you do not want them to go crispy! 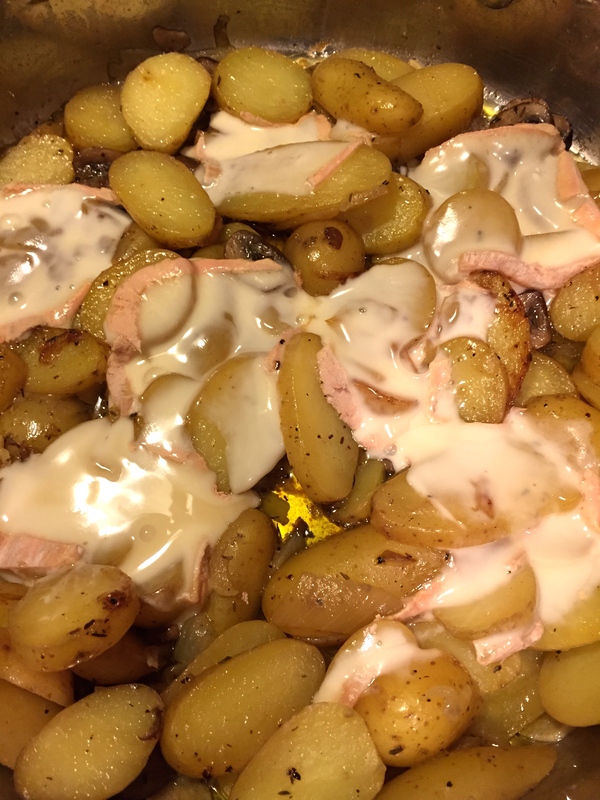 – add the thin slices of Taleggio over the potatoes.. cover the pan again – it will have melted after a few minutes. Bring to the table and serve from the pan! Cooking is a passion for me. The kitchen is the centre of my universe. If not there I can be found in a food shop, or writing about food or talking about food- or of course eating..and drinking. I have judged for The Great Taste Awards and I have written for on line magazines. This blog is named after a back room in an old house we once had which we turned into a little Italian restaurant called 'Alfredo's' after a much missed cat. Friends and family escaped there as often as possible. Now I write in my kitchen. This site follows my cooking, my musings, my recipes. Thank you for your company! Stay a little while and enjoy! My book….From Alfredo's with love…. Parsonage Farm-excellent local produce from real people. I write about everything on this blog. The world and what it contains is my fuel. Fine places in France and around the world. Breakfast, lunch, tea and afters. stories, pictures and cooking tales from an english woman living in rome.